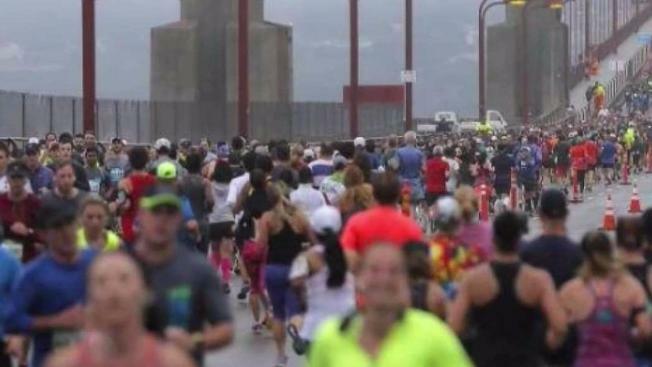 Authorities are considering shutting down all northbound lanes of the Golden Gate Bridge to motorists during the San Francisco Marathon in July. The proposal aims to bolster safety during the annual event and address terrorism concerns. "In the past, the only thing separating runners from northbound traffic were construction cones," a staff report said. "The decision to allow events to take place on the Bridge roadway always has been of concern. Each year during the permit process, safety concerns such as impaired and/or distracted drivers are contemplated, discussed and debated. Unfortunately, today, those discussions and that debate also must include consideration of the recent tragedies brought on by those intentionally driving vehicles into crowds of pedestrians at notable locations, particularly in areas where there are large concentrations of people." The Golden Gate Bridge, Highway and Transportation District Board of Directors will consider the recommendation at a meeting on Friday. Staff is recommending shutting down all northbound traffic from 6 to 9 a.m. on Sunday, July 23. Southbound traffic will be limited to two lanes. The San Francisco Marathon is expected to draw 15,000 runners between the marathon and the first half marathon. View Friday's agenda on the Golden Gate Bridge, Highway and Transportation District website.